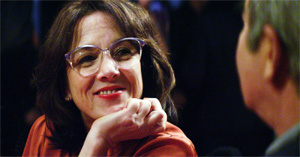 In the Chilean movie Gloria, actress Paulina Garcia wears over-sized glasses that may have the unfortunate effect of reminding American audiences of Dustin Hoffman’s look in the gender-bending comedy Tootsie. Safe to say that director Sebastian Leilo has something else in mind. The glasses, I think, have thematic significance. Despite the size of her glasses, Gloria — a 50-something woman who has been divorced for more than a decade — doesn’t always see clearly, and we’re not talking about her ability to read an eye chart. It’s a bit cliched to say, but Gloria spends too much time looking for love in all the wrong places. She bar-hops and goes to discos. When she’s not immersing herself in Santiago’s nightlife, she’s at home in an apartment where she’s tormented by a noisy neighbor who seems to be having a non-stop argument with himself. To make matters worse, the neighbor’s hairless cat keeps wandering into Gloria’s place. Gloria isn’t completely alone. She has grown children — a son and a daughter — but like most grown children, they’re busy with their own lives. The question of Gloria’s vision (perhaps judgment might be a better word) comes into sharp focus when she meets Rodolfo (Sergio Hernandez), a retired Navy man who seems to want more than an evening’s sexual release. Rodolfo is also divorced, but he feels the tug of need from his two grown daughters and from an ex-wife who apparently won’t let go. And perhaps Rodolfo doesn’t want his daughters or his former spouse to let go. For all his complaining, he’s obviously nourished by their dependancy. Beyond domestic entanglements, Rodolfo’s occupation suggests a certain immaturity. He runs a theme park where visitors can bungee jump or play paint ball. Leilo should be commended for creating a portrait of an older single woman, and you can have fun speculating about how Hollywood might have treated the same subject — presuming it even bothered with characters who carry lots of personal baggage with them as they age. A scene in which Gloria invites Rodolfo to her son’s birthday party (her former husband and his young wife also attend) shows that Rudolfo can’t deal with outsider status. For their relationship to succeed, Gloria and Rodolfo must accept the fact that not all of their history can be shared. I’ve seen the movie described as joyful, but that’s not a word I’d use in connection with a film about a woman’s attempts to battle loneliness. Garcia creates a vibrant chaacter whose persistence and liveliness keep the movie’s wheels spinning, but Gloria has moments of despair that play against its comic thrust. By the end of the film, we get the feeling that Gloria will persist — even if if she has to go it alone. Still, there’s a lingering question about whether she’ll ever find the companionship for which she yearns. Dance, in this case to a Spanish version of the disco song that may have given the movie’s title character her name, becomes the operative metaphor for Gloria’s ability to survive. Metaphorically, it’s important to keep dancing. The question for Gloria — and for everyone else, I suppose — is how to keep dancing, even after the music stops.